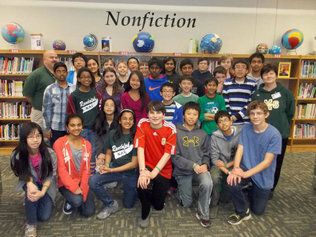 Charlotte school will face Arizona team for the Academic League championship Thursday. Randolph Middle School students Katie McDowel (front), Lauren McDowel (left) and Ben Kobos (right) answer an essay question Tuesday on how to fix the prison system. The team from Philadelphia was tough, everyone said. It had quick wits and fast hands, and if you committed anything vaguely resembling a foul, those guys would call you on it. But the upstarts from Charlotte's Randolph Middle School were the best in the city, even upending a national powerhouse from Winston-Salem, on their march to Tuesday's national semifinal. Not your typical sports competition. But the National Academic League championship is a big deal, a quiz bowl with more than 180 teams nationwide vying for honors. Armed with game show-style buzzers, players play four quarters to see who can answer the most questions about math, science, social studies and language arts. There's an opening coin toss, technical fouls for rules violations, and a gym-style scoreboard clock counting down to the end of play. The match against Masterman Middle School was held by teleconference, with the Randolph team setting up camp in a high-tech classroom at Providence High. Randolph's players seemed relaxed as the 2 p.m. start neared, but nervous energy radiated off their coaches, Michael Pillsbury and Sarah Wheeler. "Can I go get some water?" one kid asked Wheeler. "Quickly," she answered. "But stay close, close, close." She fanned herself. "I'm probably more fluttery than they are." By the end of the second quarter, the teams took a break with Randolph leading 14 to 8. Through three, Randolph still led, 33 to 26. But in the fourth quarter, questions tend to fly fast and points pile up. "This is where it's won or lost," Pillsbury said, rubbing his palms. Almost on cue, Masterman pulled within five points. Randolph fought back, barking out correct answers to math problems and identifying Minnesota as home to the Twin Cities. The momentum had turned. One of the Masterman coaches called timeout. "You're doing great, guys," Wheeler told her students. "Don't let it rattle you." They didn't. Final score: Randolph 46, Masterman 33. The Randolph kids suppressed squeals until they could gather in front of the screen and applaud their opponents. As soon as the screen went blank, they burst out in cheers, jumping and high-fiving and hugging. "It just feels good," said Tyson O'Ham, a seventh-grader. "I expected to come and lose pretty badly. I'd heard they were pretty good." On Thursday, Randolph will play Stapley Junior High from Mesa, Ariz., for the national championship. "Little old team from Charlotte beats Philadelphia," Pillsbury said. "Whether we win or not, going to the national championship is pretty exciting."